Need some eggs for your oviposition fantasy? 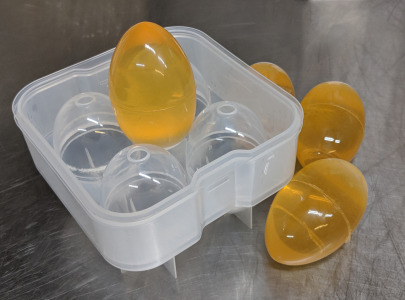 Our specially designed plastic egg mold will make 4! Each egg measures 1⅝" x 2⅝". Simply pour the gelatin (or water if you are making ice eggs) into the lower half and push the lid down. The liquid will be forced up into the upper portion of the mold (the mold does not need to be filled through the holes in the top – those are to release air and extra liquid). These molds are dishwasher safe and can withstand boiling and freezing. Here's a video to help you make the eggs, but note that this is for a different style egg mold. While we work on a new video, please use 8oz water and 2oz gelatin in place of the 14oz water and 3oz gelatin in this video.